STM-1 Mux is a cost-effective, compact (only 1U high), SDH (Synchronous Digital Hierarchy) multiplexer that is designed for applications in metro and access networks for efficient transport of traditional TDM and emerging data traffic. It provides 63 E1 TDM interfaces in only 1U standard 19" platform. It is applicable for SDH TDM point-to-point network transmission and switching. It can be used in various network topologies such as point-to-point, chain, ring, hub, and mesh networks. The STM-1 MUX multiplexes 63 E1 signals into a STM-1 stream, with TU-12 cross-connect capability. As a standard and compact SDH TDM device, the STM-1 multiplexer is best suited to applications where high-density E1 ports are required to interface with an SDH network through STM-1 fiber optic connections. 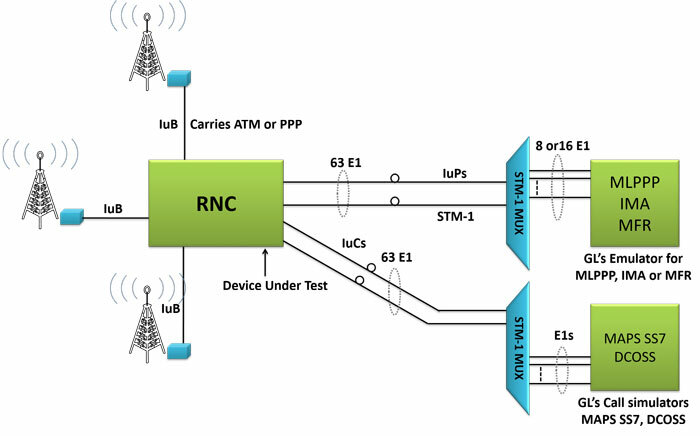 The device can be managed either through the embedded DCC channel within the STM-1 signal, or through the local RJ-45 management interface on the equipment panel. When multiple 63 E1 over STM-1 multiplexers are stacked together, an RS-485 bus may be used to link the units to form a single managed object. There are also alarm indication lights and a LCD screen on the panel for operation monitoring. Shown below is a typical application with GL’s Dual, Quad, and Octal E1 Cards. Both directions of an STM-1 signal are received non-intrusively from a satellite link and then these signals are demultiplexed by the STM-1 Mux. The E1s are then fed to GL’s E1 Cards for framing and access to voice timeslots. All 126 E1s can be analyzed, recorded, or listened (126 x 30 = 3780 timeslots). There are several 63 E1 mappings into and from an STM-1 signal. The STM-1 Mux supports all possibilities, including Motorola, Huawei, and Lucent.